Japanese style copper-plated jigger measure. Marked 25 ml one side. Marked 35 ml (measuring line inside) and 50 ml. This product is not Government approved for serving legal measures of alcohol. 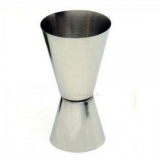 It must be used in conjunction with a government approved thimble measure or other approved measuring device for serving measures of alcohol.